Casa de San Pedro B&B now accepts PayPal. When you book your reservation online on our website (www.bedandbirds.com) by clicking on the Check Availability/Make Reservations button, you can check room availability, pick the room you want, and the dates for your visit, and when you begin your check-out you will be afforded the opportunity to select a payment type. Select either the PayPal button or the button for other credit cards. Of course we still accept Visa, MasterCard, Discover and AmericanExpress. We strive to make sure that our customers always have the most convenient and comfortable stays. Adding PayPal to our list of payment options is yet another way to enhance your stay from the very beginning when you want to make your reservation. Of course you can always call us - and we really do enjoy talking with you to make sure we can support your stay with extra services: restaurant reservations, bird guide recommendations, special events notices, and any personal comfort or dietary requests you may have. So Just Call Us! We love talking with you ! Toll Free (888) 257-2050. 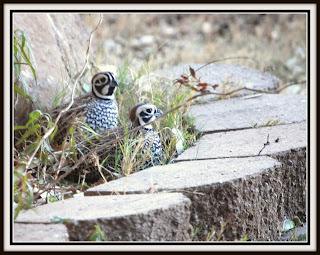 Other News: We have had a small family of Montezuma Quail in our yard this winter. They were spotted in mid-December. These quail are always hard to find, so their appearance in our yard for great viewing (and photos!) has been exciting. Normally the Montezuma Quail are only found in the mountain canyons and steppes. We are happy that they decided to move into our yard for a bit - and to share our feeders with their cousins.